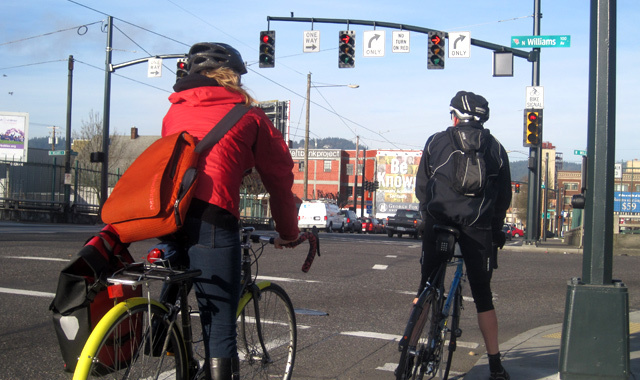 Learn about how cities can make riding a bicycle safer at intersections with lighting signals called Leading Bicycle Intervals, or “LBIs”, similar to the more familiar Leading Pedestrian Intervals, “LPIs”. 2 articles in one! Separates bicycle movements from conflicting motor vehicle, streetcar, light rail, or pedestrian movements. Provides priority to bicycle movements at intersections (e.g., a leading bicycle interval). Accommodates of bicycle-only movements within signalized intersections (e.g., providing a phase for a contra-flow bike lane that otherwise would not have a phase). Through bicycle travel may also occur simultaneously with parallel auto movement if conflicting automobile turns are restricted.